I so love your collection! Also, I love your videos! And your MAC lipstick collection is amazing! Loved you vlog :) I'm a new follower after reading Effy Talks Life's BOTM about you. Your lipstick collection is beautiful! so many pretty pinks! Also, yay you're in Huddersfield! Me too :) - The bowl in the countryside that never stops raining! 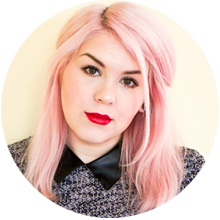 Haha, I literally just done a post on my Mac lipsticks then I saw your post on Bloglovin :) You love your pinks like me!